All over the world, democratic reforms have brought power to the people, but under conditions where the people have little opportunity to think about the power that they exercise. In this book, James Fishkin combines a new theory of democracy with actual practice and shows how an idea that harks back to ancient Athens can be used to revive our modern democracies. 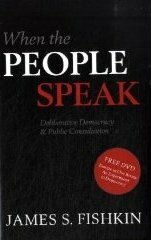 The book outlines deliberative democracy projects conducted by the author with various collaborators in the United States, China, Britain, Denmark, Australia, Italy, Bulgaria, Northern Ireland, and in the entire European Union. These projects have resulted in the massive expansion of wind power in Texas, the building of sewage treatment plants in China, and greater mutual understanding between Catholics and Protestants in Northern Ireland. The book is accompanied by a DVD of "Europe in One Room" by Emmy Award-winning documentary makers Paladin Invision. The film recounts one of the most challenging deliberative democracy efforts with a scientific sample from 27 countries speaking 21 languages. Fishkin, J. (2009). When the People Speak. Oxford University Press.